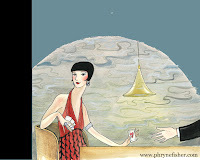 Writing the Phyrne Fisher books (m), Australian author Kerry Greenwood has created quite an entertaining and successful mystery series. Set in 1920's Australia, it has resonated widely with readers around the world - especially in Australia where it has inspired a hugely popular TV Mini-series. NoveList describes the writing as "character driven and fast paced, with an engaging, witty writing style." The overall tone is humorous and the Australian setting is a key appeal. Checkout the author's cool website for this series for more details. Phyrne Fisher first appeared on the scene in 2005's Cocaine Blues. The nineteenth installment is Unnatural Habits. "1929: pretty little golden-haired girls are going missing in Melbourne. But they're not just pretty. Three of them are pregnant, poor girls from the harsh confines of the Magdalen Laundry. People are getting nervous. Polly Kettle, a pushy, self-important Girl Reporter with ambition and no sense of self preservation, decides to investigate--and promptly goes missing herself. It's time for Phryne and Dot to put a stop to this and find Polly Kettle before something quite irreparable happens to all of them. It's a tale of convents and plots, piracy, murder and mystery... and Phryne finally finds out if it's true that blondes have more fun. Fantastic books. I've been devouring the series since I discovered it early last year.